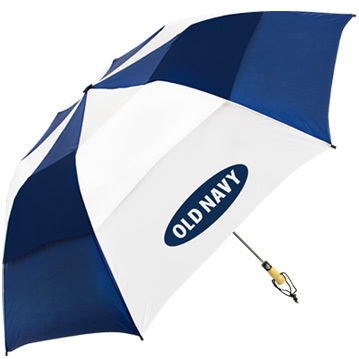 Screen printing umbrella panels is our standard imprint method. 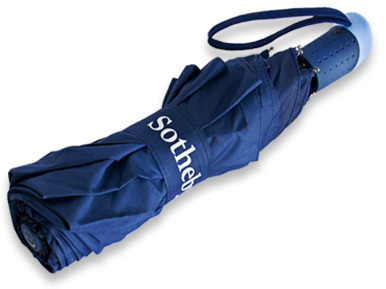 For expert craftsmanship on one and two-color logos there's no better way to start decorating your umbrella. All of our umbrellas have this option, without exception. Reorder Setup: $30.00(C) per color, per design; within 18 months of prior order. Reorder Panel Setup: $125.00(C) per color, per design; within 18 months of prior order. Reorder Valance Setup: $90.00(C) per color, per design; within 18 months of prior order. Have your logo seen by the person holding the umbrella! Printing underneath the canopy opens new opportunities. Note: The SB-2700 UV umbrella cannot have undercanopy prints due to its metallic surface. 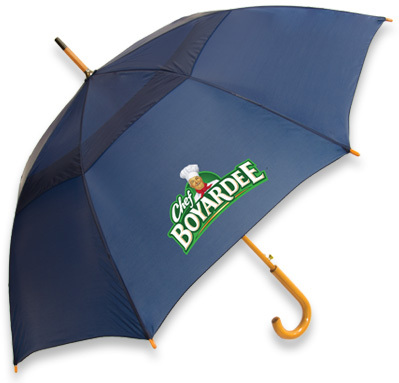 Case (sleeve) printing is a terrific option for taking your promotional umbrella a step further. Not only does a printed case make your project more complete, it creates brand visibility even when the umbrella is closed. Note: The SB-2700 UV umbrella cannot have case prints due to its metallic surface. Imprint area maximum is approximately 1.5" high and width varies by item. Genuine hardwood handles look fantastic on their own yet a laser engraving will make for a truly unique umbrella. We'll etch your company's logo directly into the handle or personalize each one with individual names/initials. To view items with laser-ready handles, Click Here. Imprint area maximum is approximately 0.6" high and width varies by item. 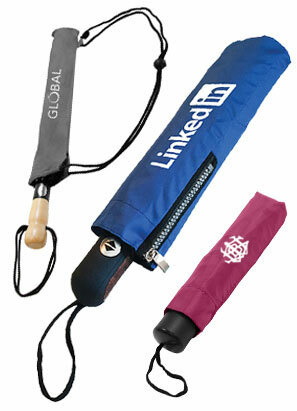 Our wide ties (straps) give you an additional print option when trying to maximize your umbrella's marketing potential. 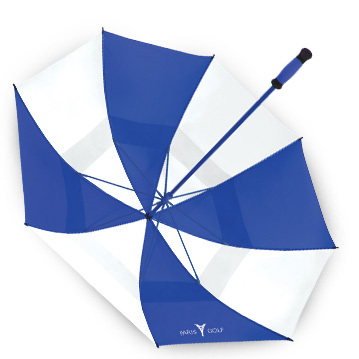 It's a great way to add promotional value to your umbrella and a unique print location for showing your brand. Imprint area maximum is approximately 0.75" high and width varies by item. No matter how elaborate your logo might be—gradients, multi-color designs, tight registration—4-Color Process Printing makes the job possible. This cost-effective option allows you to have your logo as you need it, without any limitations screenprinting might have. 4-Color Process is only available on outer umbrella canopy panels. It cannot be used with undercanopy printing, wide tie printing, or case printing. PMS matches are unavailable with 4-Color Process, since CMYK values are used for Process printing (instead of Pantone inks). But because we use the exact CMYK values from the artwork, this can simulate color matching (to an extent) for companies with pre-determined CMYK values in their branding. Process color is not available for patio umbrellas. Rush orders are not available with process color printing. Click here to download this Process Color information as a convenient PDF!